Hardback. 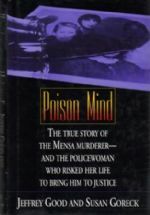 The true story of the Mensa murderer, and the policewoman who risked her life to bring him to justice. In 1988, in Alturas, Florida, George Trepal, an eccentric 39yr. old computer whiz who was a leader in the local chapter of the high-IQ club Mensa, poisoned his next-door neighbours, the Carr family, by inserting the rare poison thallium in their supply of Coca-Cola. The Alturas police appointed agent Susan Goreck to go undercover to catch Trepal in order to gather the evidence needed to convict the dangerous killer. For 17 months, Goreck, as "Sherry Guin", befriended Trepal in an effort to convict the dangerous killer. Her story, as well as the details of the case are retold in a more than intriguing real-life whodunit. As Goreck matched her wits with a brilliant psychopath, she had to cope with sexism in the police force, the expectations of her policeman husband and children at home, and her own drive to excel at both. Goreck did overcome her many obstacles and eventually cracked the case. Illus. 353pp. 8vo. h/back. From the library of true crime writer, Wilfred Gregg, with his personal b/plate. Review copy with loosely inserted slip + book review. F. in f. dw.